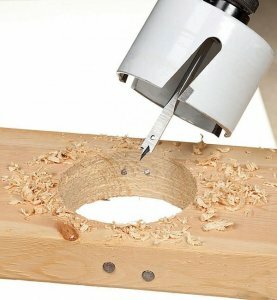 Sometimes when you want to drill a hole there is more than just wood you have to deal with. Ideal’s new Tri-Bore Hole Saw features Tungsten Carbide which allows it to cut through cement board, plastic board, plaster, composite materials, and even nail-encrusted wood. The Tri-Bore works just like a regular hole saw except it has three large carbide teeth in lieu of the many small teeth found on a traditional hole saw. The diamond-sharpened teeth are said to provide an ultra-aggressive yet cleaner cutting action with minimized vibration. Each hole saw is precision balanced to further improve performance and drilling comfort. If these sound too good to be true it is because they do have a higher initial cost, but that doesn’t mean they aren’t worth it. My suggestion would be to replace the size you seem to go through the fastest, and see if it meets your needs.